Intel Corporation in April 2019 introduces the Intel Agilex FPGA. The family of field programmable gate arrays addresses the data-centric business challenges across embedded, network and data centre markets. Credit: Intel Corporation.2 Apr 2019 San Francisco - Intel has launched a brand-new product family, the Intel Agilex FPGA. This new family of field programmable gate arrays (FPGA) will provide customized solutions to address the unique data-centric business challenges across embedded, network and data centre markets. "The race to solve data-centric problems requires agile and flexible solutions that can move, store and process data efficiently. 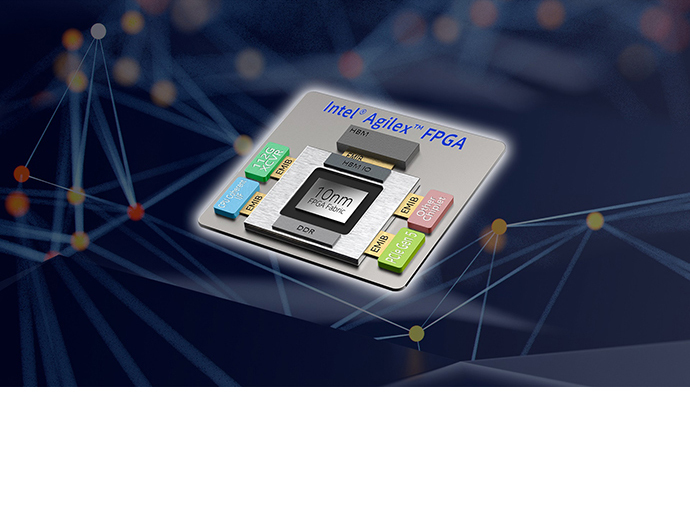 Intel Agilex FPGAs deliver customized connectivity and acceleration while delivering much needed improvements in performance and power for diverse workloads", stated Dan McNamara, Intel senior vice president, Programmable Solutions Group. Customers need solutions that can aggregate and process increasing amounts of data traffic to enable transformative applications in emerging, data-driven industries like edge computing, networking and Cloud. Whether it's through edge analytics for low-latency processing, virtualized network functions to improve performance, or data center acceleration for greater efficiency, Intel Agilex FPGAs are built to deliver customized solutions for applications from the edge to the Cloud. Advances in artificial intelligence (AI) analytics at the edge, network and the Cloud are compelling hardware systems to cope with evolving standards, support varying AI workloads, and integrate multiple functions. Intel Agilex FPGAs provide the flexibility and agility required to meet these challenges and deliver gains in performance and power. The Intel Agilex family combines FPGA fabric built on Intel's 10nm process with innovative heterogeneous 3D SiP technology. This provides the capability to integrate analog, memory, custom computing, custom I/O, and Intel eASIC device tiles into a single package with the FPGA fabric. Intel delivers a custom logic continuum with reusable IPs through a migration path from FPGA to structured ASIC. One API provides a software-friendly heterogeneous programming environment, enabling software developers to easily access the benefits of FPGA for acceleration. 1. Compute Express Link: Industry's first FPGA to support Compute Express Link, a cache and memory coherent interconnect to future Intel Xeon Scalable processors. 2. 2nd-Generation HyperFlex Architecture: Up to 40 percent higher performance or up to 40 percent lower total power compared with Intel Stratix 10 FPGAs. 3. DSP Innovation: Only FPGA supporting hardened BFLOAT16 and up to 40 teraflops of digital signal processor (DSP) performance (FP16). 4. Peripheral component interconnect express (PCIe) Gen 5:Higher bandwidth compared with PCIe Gen 4. 6. Advanced memory support: DDR5, HBM, Intel Optane DC persistent memory support.